Today is mostly a cool down day. I assume the Legend Deck starts next week. ACT (RC): [Place this Unit into the Soul] Choose 1 of your Units, during that turn, it gains Power+3000. And Now For A Word From The Vanguard R&D Department!! “Rummy Labyrinth Under the Moonlight” has a very rare SP Clan Pack that includes cards that enhances the 2 clans of 《Pale Moon》 and 《Granblue》 that are used by Rummy Labyrinth in the animated series, but this super luxurious pack also includes a “Going First / Going Second Counter”! If you get it, you’ll be super lucky! The “Going First / Going Second Counter” is an item that’s useful when you forget if you’re first or second after Mulligan-ing. Since it’s included in the SP Clan Pack, it’s an extremely rare counter, so if you get it, be sure to use it! And continuing with the introductions, “Howard the Ghostie”, the first 《Granblue》 Draw Trigger to have an effect! Since “Vampire Princess of Starlight, Nightrose” needs Soul, it’s a card that’ll be handy in a “Nightrose” centric Deck. Also, because it has “Ghostie” in its card name, it’s also a useful “Ghostie” support card. Finally tomorrow, “Rummy Labyrinth Under the Moonlight” goes on sale. 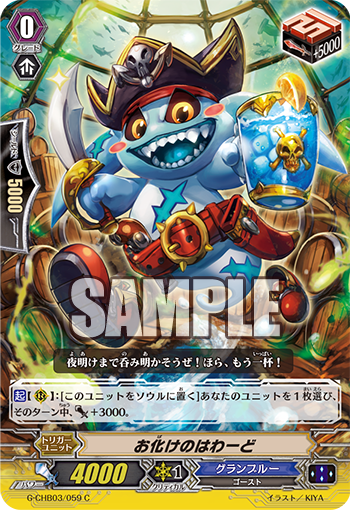 Today, we’re also revealing Deck Recipes that use cards included in “Rummy Labyrinth Under the Moonlight”! So be sure to check them out! Copyright © 2019 Cardfight Coalition. All rights reserved.